In a word-drunk romp through an alternate, preapocalyptic America, Ana Simo’s fiction debut, Heartland, turns the classic murder mystery on its head with the story of a thwarted author’s elaborate revenge on the woman who stole her lover, blending elements of telenovela, lesbian pulp noir, and dystopian satire. 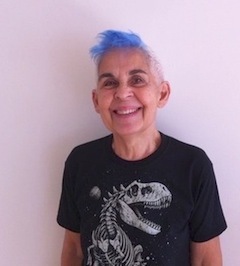 Ana Simo is a New York playwright, essayist, and lesbian activist. Born and raised in Cuba, she immigrated to Paris in time to witness the May 1968 revolt, and participate in early women’s and gay and lesbian rights groups. Since moving to New York in 1973, she has written some dozen plays, collaborated with experimental artists, and co-founded literary and activist projects. She recently finished a second novel, Tannhäuser’s Dream, and is currently writing a new one, titled Divine Light.